When you are being interviewed for a a job that you are really interested in, not only for the job responsibilities, but also because you like the company after what you’ve researched and seen after meeting with your interviewers and you actually see yourself being part of that team and delivering in that potential new job, there are key factors that you have to point out. 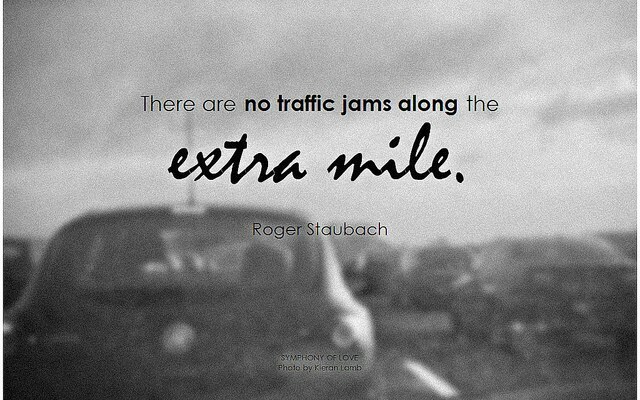 Like going the extra mile to show your interest. Remember it’s not enough that you know it yourself, you also have to show and let people know! So what are those key factors that you need to know to go the extra mile with your interview for that job you want? Say things and propose new ideas that you would start putting into practice as if you would have received the job offer already. To do this, lean on your relevant experience and make a clear connection to the position you’re interviewing for. And not just socially! Yes, you want to be likeable and accessible as a team member but you also want to demonstrate that you understand the structure of the potential new role and its responsibilities. By making an effort to clearly articulate your understanding of the job, you’ll stand out among all the other charming and friendly candidates. Enthusiastic, not desperate. You need to know the difference. One thing is to make thoughtful questions as a result of your research about the company, and a very different thing is to ask about every single thing you see around you as if you were a baby. A balanced interview, where you have the opportunity to show your professional side as well as point out some positive aspects of your personality, is usually the best way to go. HR managers want to know about your professional experience as much as they want to know who you are, or at least what you like to do, outside working hours. Chatting about things you’re interested isn’t just a confidence booster, it makes you a more compelling candidate as well. Everyone loves a little quirkiness. Try taking this advice into practice on your next interview. Maybe you won’t have enough time to chat about everything, but at least one or two will let the interviewer know that you’re not the regular candidate.